Following passage in the Senate and House, President Donald Trump Monday night signed a bill to fund the government for three weeks and end the three-day-long federal government shutdown. Congress had agreed to the short-term funding bill earlier Monday after Senate Republicans provided assurances to Democrats that immigration reform and other contentious issues would be addressed in the near future. After the Senate passed the bill by an 81-18 margin Monday afternoon, the House of Representatives concurred with the measure 266-150, sending it to President Trump. Between 700,000 and 800,000 federal employees were furloughed during the standoff, according to the Office of Management and Budget. 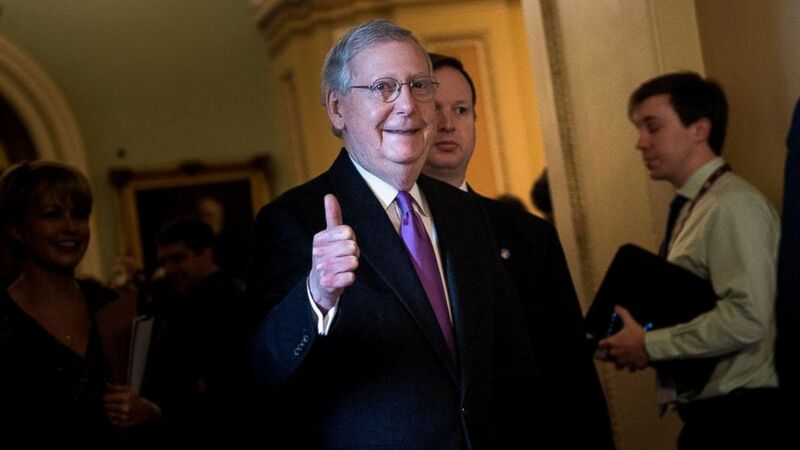 The deal was reached after Senate Majority Leader Mitch McConnell pledged that it was Republicans’ “intention to take up legislation here in the Senate that would address DACA, border security and related issues, as well as disaster relief.” Democrats had attempted to tie protection for Dreamers — some 800,000 undocumented immigrants brought to the U.S. illegally as children — to the funding bill. They had been covered by the Deferred Action on Childhood Arrivals (DACA) program, started under President Obama but ordered ended by President Trump. “Let me be clear: This immigration debate will have a level playing field at the outset and an amendment process that’s fair to all sides,” McConnell said. The continuing resolution to fund the government, which also included six years of funding for the Children’s Health Insurance Program, passed after the Senate voted to end debate earlier in the day over the objections of just 18 senators. Among the Democratic senators who voted against the measure were several rumored to be interested in a 2020 presidential run, including Sens. Kamala Harris, D-Calif., Cory Booker, D-N.J., Elizabeth Warren, D-Mass., and Kirsten Gillibrand, D-N.Y.
“I am pleased Democrats in Congress have come to their senses and are now willing to fund our great military, border patrol, first responders and insurance for vulnerable children,” said Trump, in a statement read by Sanders at Monday’s White House press briefing. Despite keeping isolated from Democrats during the shutdown, Trump met with Sens. Joe Manchin, D-W.V., Doug Jones, D-Ala., and a group of six Republicans Monday afternoon to chart a path forward on immigration. “As soon as the Senate voted to reopen the government, the President continued conversations on the next steps on responsible immigration reform,” Sanders said in a statement. Earlier in the day, some moderate and Democratic senators had told ABC News that they hoped McConnell would delay the vote to allow a little more time to work out a broader deal. The cloture vote, which required 60 votes, had already failed once and Republicans were looking for as many as seven Democrats to join them as of Monday morning. Behind closed doors, Schumer explained to fellow Democrats that their position in the minority precluded them from seeking a perfect deal, but expressed satisfaction at the progress made towards bringing significant immigration information to the Senate floor. The effort to end the shutdown was successful despite the trepidation of some senators who emerged from bipartisan negotiations early Monday in agreement that McConnell needed to clarify his immigration-related promises. While Flake characterized McConnell’s effort as a “pretty high-profile promise,” and some Democrats said that they felt additionally encouraged, it was far from certain that a solution would pass. Senator Bill Cassidy leaves the Senate floor on Capitol Hill after the Senate voted to fund the US government, Jan. 22, 2018, in Washington. ABC News’ Meridith McGraw, Jordyn Phelps, John Parkinson, Christopher Donato, David Caplan and Meghan Keneally contributed to this report.